The above image shows the OEM components that make up the MGB 68-76 all-synchromesh gearbox shift assembly. We can provide you with these items as long as they are available from Moss Motors; otherwise you will have to source them yourself. For easier gear change action it is necessary to provide sufficient clearance between the gearshift knob and the lower edge of the heater control panel. We recommend that the gearshift lever be shortened by 2 inches. First, have the gearshift lever machined and threaded to the appropriate size (3/8" USS), followed by the shortening of the lever in the aforementioned amount. The image shows the correct angle of the gearshift lever when fitted (angled rearwards). You can use either of the 2 shown retaining plates. The upper plate is fitted to the MGB 68-76 models, and the lower 77 onwards model. Be sure to fit the shoulder type bolts only, along with their special spring washers. The lower right portion of the image shows a brass plunger and plunger spring. You will be surprised how many times I have found these missing. 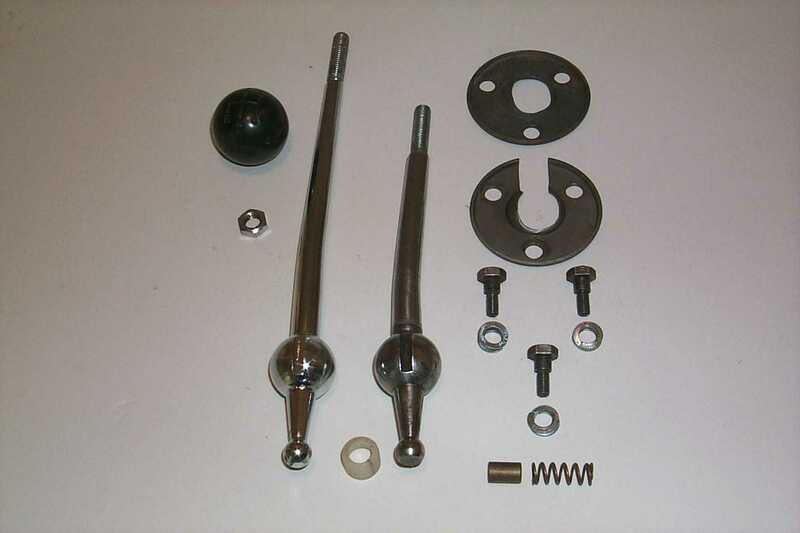 The combination of the plunger and spring assembly provides a small amount of pre-loading on the spherical ball portion of the gearshift lever. We recommend the use of wheel bearing grease, or similar, to hold these two items in place. Before assembling the gearshift lever into the transmission, don’t' forget the anti-rattle bush. Here again, use a good coating of wheel bearing grease, or similar, on the contacting parts. Do not force the gearshift lever in to position, or you may end up dislodging the anti-rattle bush from the lever.